WLMP is not a video format. A WLMP file is a project file that contains movie transitions, music, effects and links. Created by Windows Live Movie Maker, WLMP is not user friendly. In the following cases, you have to download best video converter and convert WLMP to MP4 or other video formats like WMV, MOV, etc. 1. You need to open and play WLMP files on VLC media player, QuikTime or other players on Mac/Windows. 2. Play WLMP files on iPhone, iPad, Android mobile phones and tablets. 3. Upload to YouTube, Flickr, Facebook, Vimeo etc. social network sites and share WLMP file with friends and families. 4. Open, play and edit WLMP on Mac without Windows Live Movie Maker, and in other situations where you need to convert WLMP to mp4. Free download the best WLMP file converter here and follow steps to convert WLMP to MP4 for more convenient playback, editing, uploading and sharing. There are a number of WLMP file converters, from paid to free, online to desktop software, among which MacX Video Converter Pro is the best and most popular WLMP to MP4 free converter. It enables you to convert WLMP to MP4 quickly without losing quality thanks to advanced HT tech, support for Multi-core processing, hardware acceleration tech, and built-in High Quality Engine. With support for a wide range of codecs, the WLMP to MP4 file converter can save WLMP as MP4 without problems, and convert WLMP to WMV, AVI, MOV and many other video formats. Follow steps below to learn how to start and you'll find more useful features. 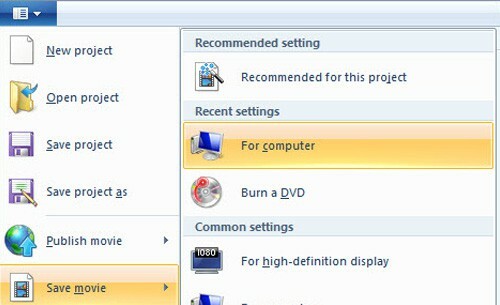 Run Windows Live Movie Maker on Windows PC, click File button at the top left of the main window, click Open Project and select the source .wlmp file to load. Then head to File > Save Movie and select Windows Media Video File (WMV) from the drop down menu of Save as type. Click Save and your WLMP file will be exported to WMV video. Windows Live Movie Maker can also free convert WLMP to MP4. But we don't recommend you to do so since many users complain problems, such as audio and video out of sync, audio missing. 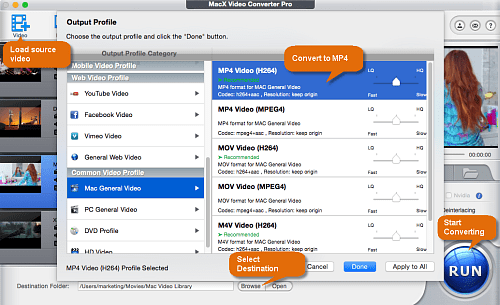 Run the WLMP to MP4 converter after you downloaded it for Mac or for Windows. Click Add File icon on the left and select the target WMV file. Batch conversion is supported by the WLMP to MP4 video converter free. An Output Profile window will pop up. Select MP4 format on the window and click OK. You can also convert WLMP to WMV, MOV, AVI, and many other formats, or you can directly convert WLMP to Android Samsung, PSP, iPhone, iPad, iPod, YouTube format, to name a few. The WLMP to MP4 converter offers numbers of preset profiles. Click Edit button and you can further edit WLMP file before conversion, for example, add subtitles, watermark, crop, trim, and more without Windows Movie Maker. Click "RUN" button at the bottom right corner to begin the WLMP to MP4 conversion process. The time it needs to finish the WLMP to MP4 conversion also depends on the source file size and your computer performance. The steps can also be applied to import AVI to iMovie, WLMP to WMV, AVI to MP4, WMV to MOV and more. WLMP stands for Windows Live Movie Project. WLMP files are created by Windows Live Movie Maker and are always used to make movies and slideshows to share with friends or burn to DVDs after converting WLMP to WMV or MP4. In fact, WLMP is not a video format. Only Windows Live Movie Maker can open and play WLMP files and it allows users to save WLMP to MP4 or WMV format for later burning to DVDs or uploading to YouTube or sharing with friends. But you may encounter problems with converting WLMP to MP4 or WMV format using Windows Live Movie Maker due to the lack of codecs, for example, it ends up audio or video missing, WLMP not being exported to WMV, MP4 etc. To open and play WLMP files with VLC, QuickTime on Mac/PC, iPhone, iPad, Android devices, you have to convert WLMP to MP4 or other accepted video formats. Free download the fastest WLMP to MP4 video converter - MacX Video Converter Pro to quickly convert WLMP to MP4 on macOS and Windows with nearly original quality kept in 5x faster speed than other free WLMP converters, and play/edit/upload WLMP files easily.